Number Puzzles are a wonderful way for students to practice new concepts as well as have a spiral review of previous content. 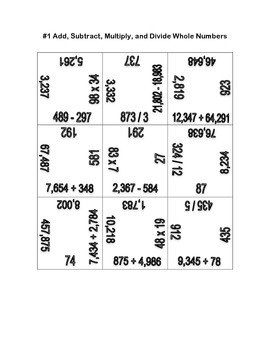 There are 9 number puzzle squares that match together to form a 3 x 3 square when all problems are solved correctly. This product includes 5 different number puzzles that focus on adding, subtracting, multiplying, and dividing whole numbers. 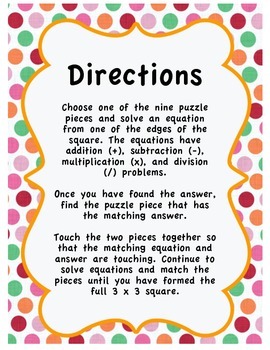 It also includes two versions of the number puzzles to use for differentiation among students. 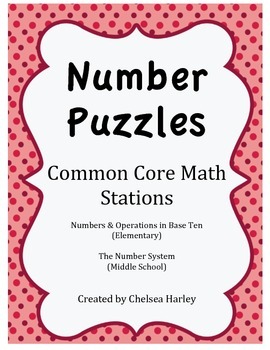 I use Number Puzzles as a math station in my classroom. Students use the "Show Your Work" page to solve the twelve computation problems. As each equation is solved, the student matches the equation to the answer on another square. This is a great way for students to self-check their work. Once the entire 3 x 3 square is complete, students may double-check their answers against the answer key. Problems can be solved individually or in partners. 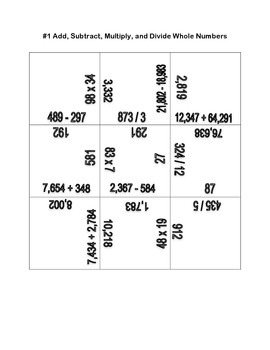 Students are engaged and can complete the same Number Puzzle multiple times throughout a unit because the squares are always put together in a different way. My students love the Number Puzzles!